The "M" and the "4"
The History of the "M" and the "4"
Welcome to the world of the M4 Images! It seems that the "M" and the "4" have become synonomous with class and stature in the Atlanta area. 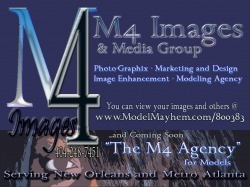 We are now taking the brand to New Orleans and moving into "elite" status with the well-knowns in the New Orleans area. But not before we give you a brief history of what we are, and have been, all about since the inception of the brand. The history of the “M” and the “4” is derived from a moniker to a nationally known writer and poet. “Metta4...the Poet”...a visionary with a very creative spirit. The name Metta4...the Poet came from the idea that you should look closely at the content, what you see may not be what’s there. In his creative mind-works he has accomplished everything from musical tracks for artists and musicians in the New Orleans area, creating graphics for CD covers, to writing and publishing 3 books of poetry and one self help book as of today under the name, “Metta4...the Poet. And there is more literary projects to come! With creativity and vision in tow, the vision permeated to getting into photography and taking pictures at a very young age. Taking pictures and capturing the images of life become more of a passion than a fleeting hobby. As the years progressed Metta4 came across the “Photoshop” program and began to work with image enhancement, thus came Metta4ric Images. From the basement of his home, he began a quest to creating and marketing a brand. That Brand being the “M4 Enterprises” A few self-help oriented companies orchestrated with public service in mind and geared to helping people in the entertainment business flourish at their chosen pathway.